Whitney Houston news. Life and times of the American singing sensation who died at 48. Whitney Houston was one of the world’s best-selling artists, wowing audiences with her powerful and effortless voice from the middle of the 80’s to the late 90’s. But the showbiz world was rocked Saturday in the afternoon with the tragic news that one of music’s biggest legends Whitney Houston is dead. Whitney Elizabeth Houston was born to a middle class family in Newark, New Jersey in 1963. She was the third and youngest child of Army serviceman and entertainment executive John Russell Houston Jr., who passed away in 2003, and gospel singer Cissy Houston. It was clear that natural talent in music ran through her family. Whitney Houston’s cousins Dionne Warwick and the late Dee Dee Warwick, and also her godmother Aretha Franklin all made a huge mark on her gospel and R&B scene. Whitney Houston first became interested in being in the music industry after frequently accompanying her mother Cissy who often performed in nightclubs. Sometimes the teen would even take to the stage herself and perform. Whitney Houston was offered her very first recording contract at the age of 14 by Michael Zanger, after she wowed him with her back-up singing on a record for his group, Michael Zanger band. The singer was forced to turn it down as her mother determined that she should instead finish school. However, in the years that followed Whitney Houston lent her voice to albums of both American soul, jazz, and blues singer Lou Rawls and Michael Jackson’s father Jermaine Jackson. Naturally stunningly beautiful, Whitney Houston began dabbling in modelling after being spotted by a fashion photographer whilst she was performing with her mother. Whitney Houston went on to become the first ever woman of color to appear in a fashion magazine after gracing the pages of Seventeen magazine in the early 80’s. Subsequently Whitney Houston appeared in Glamour, Cosmopolitan and Young Miss magazines, and also in a TV advertisement for Canada Dry soft drink. It was around that time when music mogul Clive Davis first heard Whitney Houston perform. “The time that I first saw her singing in her mother’s act in a club … it was such a stunning impact,” the record producer told Good Morning America. She made her album debut in 1985 with the self-titled record Whitney Houston. It sold millions and spawned hit after hit including Saving All My Love for You, which won her first Grammy Award for Best Female Pop Vocal. Other tracks such as How Will I Know, You Give Good Love and The Greatest Love of All also went on to become giant hits. Another multi-platinum album, Whitney, came out in 1987 and included hits like Where Do Broken Hearts Go and I Wanna Dance With Somebody. The New York Times wrote that Whitney Houston “possesses one of her generation’s most powerful gospel-trained voices, but she eschews many of the churchier mannerisms of her forerunners”. Whitney Houston’s decision not to follow the more soulful inflections of singers like Aretha Franklin drew criticism by some who saw her as playing down her black roots to go pop and reach white audiences. “Sometimes it gets down to that, you know?” Whitney Houston told Katie Couric in 1996. Some saw Whitney Houston’s1992 marriage to former New Edition member and soul crooner Bobby Brown as an attempt to refute those critics. It seemed to be an odd union, Whitney Houston was seen as pop’s pure princess while Bobby Brown had a bad-boy image, and already had children of his own. The couple went on to have a daughter, Bobbi Kristina, in 1993. Over the years, Bobby Brown was arrested several times on charges ranging from DUI to failure to pay child support. But Whitney Houston said their true personalities were not as far apart as people may have believed. “When you love, you love. I mean, do you stop loving somebody because you have different images? You know, Bobby and I basically come from the same place,” Whitney Houston told Rolling Stone in 1993. It would take several years, however, for the public to see that side of Whitney Houston. Her moving 1991 rendition of The Star Spangled Banner at the Super Bowl, amid the first Gulf War, set a new standard and once again reaffirmed her as America’s sweetheart. In 1992, Whitney Houston became a star in the acting world with The Bodyguard. Despite mixed reviews, the story of a singer guarded by a former Secret Service agent, played by Kevin Costner was an international success. It also gave her perhaps her most memorable hit: a searing, stunning rendition of Dolly Parton’s I Will Always Love You, which sat atop the charts for weeks. It was Grammy’s Record Of The Year and Best Female Pop Vocal, and the Bodyguard soundtrack was named album of the year. Whitney Houston returned to the big screen in 1995-96 with Waiting to Exhale and The Preacher’s Wife. Both spawned soundtrack albums, and another hit studio album, My Love Is Your Love, in 1998, brought her a Grammy for best female R&B vocal for the cut It’s Not Right But It’s Okay. 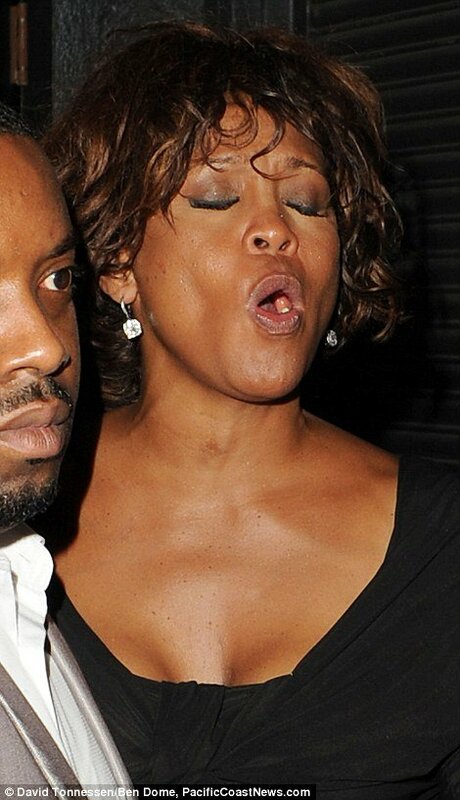 But during these career and personal highs, Whitney Houston began using drugs. In the interview, Whitney Houston blamed her rocky marriage to Bobby Brown, which included a charge of domestic abuse against Brown in 1993. They divorced in 2007. Whitney Houston would go to rehab twice before she would declare herself drug-free to Oprah Winfrey in 2010. Whitney Houston was so startlingly thin during a 2001 Michael Jackson tribute concert that rumors spread she had died the next day. Her crude behavior and jittery appearance on Brown’s reality show, Being Bobby Brown, was an example of her sad decline. Whitney Houston’ Sawyer interview, where she declared “crack is whack”, was often parodied. She dropped out of the spotlight for a few years. The singer staged what seemed to be a successful comeback with the 2009 album I Look To You. The album debuted on the top of the charts, and would eventually go platinum. Things soon fell apart. A concert to promote the album on Good Morning America went awry as Whitney Houston’s voice sounded ragged and off-key. She blamed an interview with Oprah Winfrey for straining her voice. A world tour launched overseas, however, only confirmed suspicions that Whitney Houston had lost her treasured gift, as she failed to hit notes and left many fans unimpressed; some walked out. Canceled concert dates raised speculation that Whitney Houston may have been abusing drugs, but she denied those claims and said she was in great shape, blaming illness for cancellations. Recently Whitney Houston appeared to be battling her demons once more. She was spotted looking worse for wear earlier this week in Hollywood, California after enjoying a party with friends. Whitney Houston had been a guest at the Kelly Price & Friends Unplugged: For The Love Of R&B Grammy Party at Tru Hollywood and had even performed during the night. whitney houston/ who was the ex-mamager of whitney that wrote a book on her back in the early 90's?? Whitney Houston death. Bobby Brown broke down in tears during his concert in Mississippi.